The Health O Meter 2650KL wheelchair scale has a capacity of 1,000 lbs and a readability of 0.2 lb with a base size of 31-1/2 x 31-1/2". 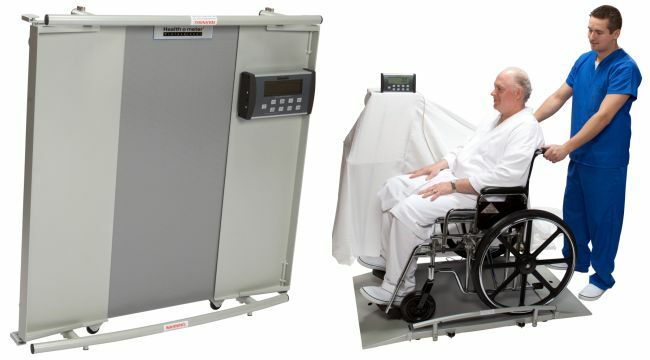 The Health O Meter 2650KL and 2700KL digital wheelchair scales offer wide bases, EMR connectivity and easy transport and storage. 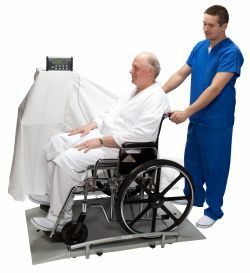 The scales have the standard Health O Meter digital indicator with USB connectivity that connects to Electronic Medical Record (EMR) systems for electronic recordings of patient weight. The wide base (31.5 inches) of the 2650KL and high capacity will accommodate most bariatric wheelchairs. Available in one and two ramp configurations the scales also have two transport wheels and can stand upright while leaning on the side guide rail.